If you’ve been on one safari, you’ve been on them all – until you visit Sanbona Wildlife Reserve in the Little Karoo. It’s actually situated close to Montagu, a three-hour scenic drive from Cape Town along Route 62, and in a malaria-free area. 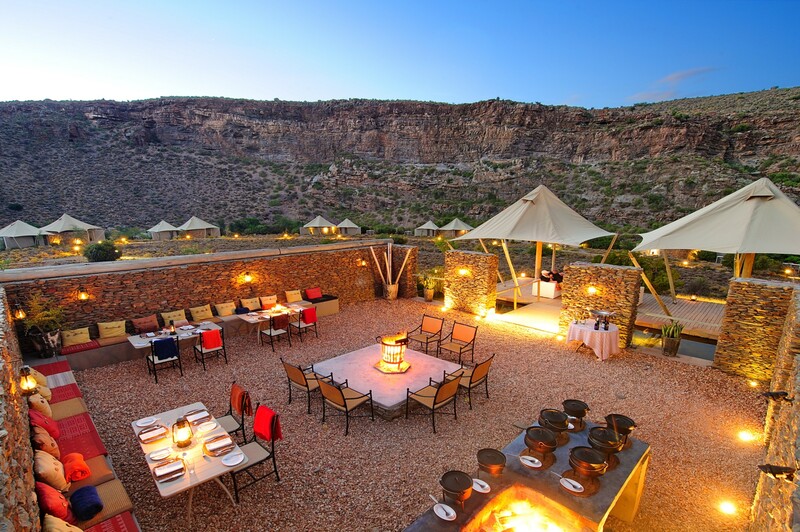 Finding luxury in the middle of the bush is easy at Sanbona because there is the newly revamped Dwyka Tented Lodge. Don’t let the description of a tent put you off, this tented lodge is set in a horseshoe bend of a dry Karoo ravine framed by beautifully weathered landscape and striking rock formations. There are nine luxury tents and nothing excited me more than discovering that each Dwyka tent has its own private deck and heated outdoor jacuzzi. The accommodation is perfect as a honeymoon destination or a couple’s weekend getaway. Meals are a curated selection of wholesome and fine dining meals, you have the option to dine at the restaurant or room service. Dwyka is the ultimate luxury experience, with the rustic elements of a tent and no compromise on modern conveniences. Sanbona is a sanctuary for indigenous flora and fauna, including the Big 5, but it is the vastness of the landscape and the alluring isolation amid the raw beauty and boundless plains which sets it apart as it stretches across 58 000 hectares of wide open Karoo plains.